In 1957 Gil Evans took the young Steve Lacy to hear the New York premiere of Harry Partch’s The Bewitched, the musical satyr-play inspired by ritual theater traditions of Greece, Africa, Asia. Even for the open-eared Lacy, the strange harmonic world generated by those wondrous instruments invented by Partch must have come like a knock at the mind’s door, a call to new possibilities of performance. Partch was to remain a valued modernist reference for Lacy: in the innovative ways he incorporated dance and theater; in the degree to which he drew on indigenous and non-Western traditions, bringing new emphasis on rhythmic elements and microtonal nuance into contemporary music; in his phenomenal persistence as an outsider artist; and above all, perhaps, in his use of a wide array of texts. Eleven Intrusions (1949-1950), for instance, offers delicate musical settings to texts by Lao Tzu, Ungaretti, and others, recited by an ‘intoning voice’ that bears some resemblance to the spoken-sung approach in Kurt Weill’s songs or the delivery of the later Beat poets, both touchstones for Lacy’s lyric sensibilities. Surely, though, it was the four works collectively called The Wayward that held the greatest resources for Lacy, in their focus on vernacular American speech and their reflection on Partch’s own years as a hobo. These pieces set journal entries, newsboys’ cries, a letter, and hitchhiker inscriptions (Barstow); in his own way, Lacy would later set speeches, postcards, a recipe, obituary notices. The best known piece, U. S. Highball (1943/1955), a full-blown oratorio in Partch’s revised version, based on the voices and places he noted during his travels, conjures a sound universe more thoroughly in the American grain than all the drawing room froth whipped up before or since. Even decades after his passing, the originality of his vision has not dimmed. Throughout the 1950s, in his trajectory from Dixieland to Cecil Taylor and Thelonious Monk, Lacy was listening to Miles Davis. 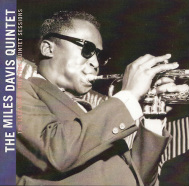 The first record of modern jazz he heard, in 1952, was by Miles. In 1959, as the only saxophonist in Gil Evans’s big band for two weeks at Birdland, he played opposite Miles’s group and was able to appreciate Coltrane’s growth since first joining Miles. The original quintet with Coltrane, which made five records over three sessions from 1955-56 that are now repackaged by Prestige as a distinct set (with an added disc of unissued live tracks), held lessons aplenty not just for musicians looking beyond bebop who still kept faith in chord changes but also for more outward bound figures. Lacy in particular was attuned to the band’s harmonic research, how phrasing and intervals (let alone Miles’s use of the mute) could shape an emotion, and how Miles and Coltrane developed a deep understanding of scales. Moreover, Miles’s concept of the rhythm section was paramount in the mise en scène of a piece, how the rhythm could give dimension, shadowing, support, contrast, to the melodic players. The fact that these dates consist largely of jazz standards and pop tunes helps to focus more on the approach, the playing: in “‘Round Midnight” and “Oleo” the band takes nothing for granted, every passage marks unexpected choices in its treatment; “Surrey with the Fringe on Top” and “You’re My Everything” gain more than a makeover, they show a depth that still resonates fifty years later. With all that has come along in music since then, including his own, Miles’s poetic economy was really finding its true proportions on these sessions, such that they now seem almost inevitable. With feet planted barely onshore somewhere, ears leaning out to sea, these ten pieces for radio build from a syntax of foghorns, bells, water sounds, talking voices, and the improvisations of ten new-music soloists. Curran remains alert to the come and go of sympathetic tones, swells of memory, traces of escaped narratives lingering offshore. Throughout, there is a movement toward home, the boats returning from the open sea and close enough now despite the fog to navigate by the sounds. Yet the pieces themselves are places to dwell---deep breaths of specific points along the Eastern seaboard, with their distinctive foghorns, boat horns, gongs, whistle buoys, bell buoys, recorded on location from Maine to Maryland, the testimonials from lighthouse keepers, Coast Guard personnel, lobstermen, and solos by Leo Smith, Pauline Oliveros, Clark Coolidge, Joseph Celli, Jon Gibson, Malcolm Goldstein, George Lewis, John Cage, freely restructured and mixed by Curran. The third of these pieces features Steve Lacy performing his work “Coastline,” which in turn was inspired by the Italian coastline. It was in Rome that Lacy first knew and worked with Curran in Musica Elettronica Viva in the late ‘60s, and they collaborated once in a while ever since. Here Curran renders a ringing tribute to Lacy as musician, doubling his saxophone back on itself and producing a multiple dialogue with the long searching notes of the foghorns; one could easily imagine whales coming to join in. This record appears 20 years after these pieces were first heard on some 50 radio stations across America, which seems to make the music more than ever redolent with time. One of the rarest of all Lacy records, and one of the most unusual, the two twenty-minute pieces here, “Labyrinth” and “Island” (dedicated to De Chirico and Ernst, respectively), are extended improvisations with overdubs (up to six saxophones on “Island”) that revolve around Mediterranean archetypes. Commissioned and produced by Italian musicologist Gianfranco Salvatore, and recorded in Rome in 1986, these works build on the solo experiments Lacy first pursued on Lapis and later Straws, with lessons learned in the development of longer pieces, as Curran suggested with his treatment of “Coastline” in Maritime Rites (recorded just two years earlier). In the ways Lacy plays back against his own phrases, as in the lingering resonance of single lines, he seems to hear the absent horns and bells and all other manner of sea sounds and sea beings hovering in the air. The figures he finds emerging from the water are of a mind to dream. One of the main reasons he moved to Paris in 1970, Lacy used to say, was because Bobby Few was living there. He had first heard the Cincinnati native and former Ayler pianist only the year before at the Actuel festival in Amougies, Belgium, as part of the Center of the World quartet, with Frank Wright, Alan Silva, and Muhammad Ali. But Few worked with Wright for the rest of the ‘70s, so it wasn’t until 1980 that Lacy was able to recruit Few for his band and that sextet held together for nearly 15 years. Few can play in a billowing free style while sounding downright symphonic in the sweep of his gestures; whether in duo or larger units he fills out the music and propels the other players as though on a bright wave (as in Noah Howard’s Red Star, a 1977 quintet date in Paris that included drummer Kenny Clarke, reissued by Boxholder ). These Few sessions date from 2000 and 2004, starting with his virtuoso solo concert at the Vision Festival in New York. Continental Jazz Express takes up a suite first heard on a 1979 Paris recording, grounded in the tradition of impressionistic train journeys. This one, drawing on the full history of jazz piano playing, ranges as far as Africa and China: Few shows a commanding talent for simultaneity, juggling current and recurring themes while shaping several sonic spaces at once. A week later, on the trio date, he performed the first part of the piece again where it is hardly less mercurial as the sax and bass accentuate its charge. Fefer, a generation younger but wide-thinking, had spent some years in Paris working with Few, John Betsch, Archie Shepp, Sunny Murray, and had been in New York a while too. He blows full fury on the New York date, yet four years later on the duo dates from Paris and Antwerp he reflects growth, a supple strength. Kindred Spirits, comprising Monk, Mingus, and Ellington tunes, plus two by Fefer, shows him with a fine lyric control on tenor, soprano, clarinet. And in these classics, as in the originals on the other date, Few reminds us where he came from: the soulful ascensions of the jazz vanguard. Every piece he mines for its surprises, laying out a trail of jewels that open at our feet. There is just one song on clarinetist Ben Goldberg’s latest, and it is based on the brief note that Lacy sent him atop a fax of the music for “Blinks” back in 1992. The note was later turned into a song, “Facts,” haunting and ethereal as sung by violinist Carla Kihlstedt who bows in unison on the record; the song floats in like a sort of prelude to a pointillist treatment of “Blinks” that builds and gathers till it reaches the majestic statement of Lacy’s infectious theme. The tune is Goldberg’s favorite by Lacy. Goldberg had been studying and attending to Lacy’s music for some two decades when he learned in 2004 that Lacy was ill with cancer, so he wrote these dozen pieces in dedication. The record’s title, from a poem by Creeley, suggests a set of relations not entirely defined, a notion dear to Lacy. The grace of the writing here, the friendly unpredictability of the themes and the enticing voicings sketched out for the quintet, make this indeed a loving tribute. Lacy would have cocked his ear to hear all that was going on in here and surely he would have been pleased. Though a listener may hear other lights behind pianist Frank Carlberg’s jazz song writing, the rich example of Lacy’s work in this realm seems to bear a wide and fruitful echo. In his unusual structures, the sinuous and distinctive match of melody to prosody, and the spaces opened up for soloists, Carlberg meets the challenge posed by the music of different poets. And similar to Lacy, he has a vocalist precise enough to animate his projects, Christine Correa, who sings like she appreciates the quality of the lyrics, their particular breath and sway. A full-length song cycle for octet, Variations on a Summer Day (2000) expands from Wallace Stevens’s tremendously concise 12-part poem as one might imagine a life blooming from a single suitcase. The daring intervals, the choice repetition of lines, the delicate leaps of musical thought, all serve to deepen the seasonal dream of the poet. Carlberg, who long admired Lacy’s music and worked with him a bit (including an unreleased trio date with Correa), left his native Finland as a young man and has been living in the U.S. for two decades, now in Brooklyn. His protean sound is not easy to typify, adapting to the language and phrasing of each poem. Thus, In the Land of Art (2003) is like a marvelous deck of cards: the wry tango-like title song, from a poem by Anselm Hollo, follows jauntily upon the meditative spindle of a song from Robert Creeley’s little poem “Nowhere One Goes”; the playful flights of Gertrude Stein’s “Asparagus” leads to the darkening elegy of Rexroth’s “This Is the Gallows”; and after the loping dance of Chamfort’s aphorism “Wit in Fools,” Kerouac’s “Pull My Daisy” makes a riproaring closer. On his new collection of jazz songs, State of the Union (2006), Carlberg revisits some of the same poets but as part of a grander program that also takes in the terrible absurdities of the current national moment. That his music can transport such weight on the same wings that convey the metaphysical spirit of other texts is testament to solid instincts, to his continual discovery of how to hear the whole world through his art.